At a Crick 'Ask the Expert' webinar on 6/3/18, Dr Abi James drew attention to research undertaken at Runshaw College, a sixth form and FE College in England, on the use of technology in examinations. The research has found that the majority of students preferred to use a computer reader compared to a human reader and that the use of the software had a positive impact upon attainment. The report contains many useful insights on the use of technology to support candidates with additional support needs, and is well worth reading. The most common method of support used in examinations (apart from extra time and separate accommodation) was a human reader. If digital question papers were available, that could be read out by a computer reader, then candidates might be able to use technology in exams and work independently, rather than rely on human readers. Candidates would learn a useful life skill that would stand them in good stead when they left school. Candidates would learn a skill that would enable them to access curriculum resources and textbooks when a human reader wasn't available, which should raise attainment in the exam. It might be more comfortable and less embarrassing for the candidate and the human reader - if the candidate doesn't know the answer, only the computer hears about it (during the exam). It would be cheaper in terms of staff and require fewer rooms, because several candidates could sit the exam in one room, rather than requiring separate rooms with readers and invigilators. We conducted trials and piloted the digital question papers (you can read the reports on the CALL Digital Assessments website), and the results seemed to support the hypothesis, and so SQA started offering Digital Question Papers in 2008. However, just because something sounds sensible doesn't make it true, so this research report from Runshaw College is really helpful as it adds to the relatively sparse evidence base on the use of computer readers in examinations. The students who took part in the project had been assessed as eligible for the use of our human reader in examinations, i.e. the candidate has persistent and significant difficulties in accessing written text, is disabled under the terms of the Equality Act 2010, and achieves a below-average standardised score of 84 or less in relation to reading accuracy, comprehension or speed (Access Arrangements and Reasonable Adjustments, JCQ p.35). Out of 478 students who sat the GCSE English Reading paper, 44 (9.2%) were assessed as having difficulties with reading. Of these 44 students, 29 used a computer reader and 15 did not have reading help. The authors report that the majority of the 29 students (85%) preferred to use a computer reader in the exam, rather than using a human reader. The students liked the Orato text reader because it was very simple to use and therefore required little training. At the end of the project, 100% of the 17 staff involved reported that they would feel confident incorporating Orato into the practice in the class. 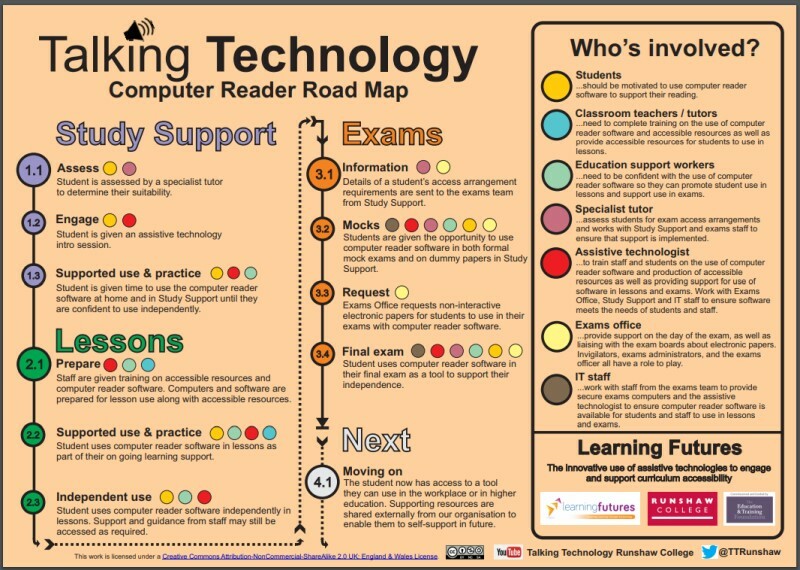 Students who use a computer text reader in an exam should also be using it to access curriculum resources. Students therefore need textbooks and other learning materials in digital format. During the project, the number of registered users of the RNIB Bookshare database of accessible textbooks increased by 414%, and the number of downloaded textbooks by 390%. The number of lessons where the computer reader was used increased from 8 to 97, and students reported that this improved their comprehension and proofreading. The authors report that many students felt the software helped improve their attainment in the GCSE English Reading paper, and this appeared to be supported by the marks achieved in the 2015 examinations, although the small number of students involved means that these results should be viewed with some caution. In addition, it is not clear from the report whether any of the students used a human reader, and if they did, what attainment was achieved by the students in the Reading paper. The project team produced a really useful set of resources which would be very helpful for anyone thinking of introducing computer readers into schools, and particularly if you're thinking about examinations. Talking Technology Runshaw College YouTube Channel with advice on using Orato and computer readers in examinations. Videos from Stakeholders (e.g. staff, Exam Officer, Assistive Technologist) who were involved in the project. A summary of the Assistive Technology Tools and Resources used in the project.